Way back in ancient Greece, Plato was philosophizing about a menu based solely on greenery, making him — along with Buddha, Gandhi and Einstein — among history’s foremost plant diet trendsetters. Even so, the vegan lifestyle is having a remarkable boom today, with a proliferation of in-demand meat and dairy-free restaurants, bakeries and bars around the globe. In light of PETA officially declaring 2016 “#TheYearofVegan,” here are our top picks for cities with the best lean, green vegan scenes. Portland earned top marks from PETA as America’s #1 Vegan-Friendly City for 2016, and many vegans around the world would strongly agree. “Portland, Oregon is hands down the best city for vegans in the entire country,” declares Will Travel For Vegan Food blogger Kristin Lajeunesse. Vegan-focused film and events producer Demetrius Bagley also co-signs Portland’s plant-eating preeminence. “I really enjoyed the atmosphere and cocktails at Sweet Hereafter … and decadent, sometimes obscene, down-home comfort food of Homegrown Smoker,” he says. Berlin remains Europe’s Capital of Vegan, with more exclusively vegan restaurants than any other city on the continent (Prague and Warsaw come in second and third, respectively), according to major vegetarian/vegan website HappyCow.com. “You don’t want to inconvenience others with your dietary restrictions and around here you don’t have to,” says Sandra Espenhain, a local vegan. Upscale choices abound as well, including Kopps, where diners can indulge on five-course dinners in the city’s first high-end vegan restaurant, having opened in 2011. 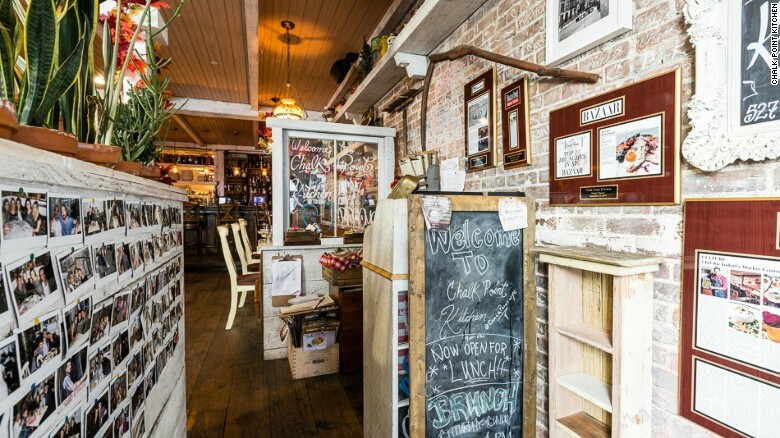 Chalk Point Kitchen serves only seasonal, farm-to-table food. New York City, unsurprisingly, offers the most vegan food options in the United States. “New York City is truly the heart of the vegan scene in the East Coast,” says Carmen Surana, the Catering Manager for The Cinnamon Snail vegan food truck. NYC also hosts some of the most trendy vegan/vegan-friendly spots in the world. These include the new, swanky pizza joint 00 + Co. in East Village and Chalk Point Kitchen, which “has become the go-to for celebrities and savvy New Yorkers,” says local insider Chetna Sabnani. With a population just shy of four million — America’s second largest — the West Coast metropolis was bound to have a variety of dining options for alternative diets. In fact, some vegans, such as Atlanta-based Bryan Prewitt, say L.A. has the edge over the Big Apple. “While both have great vegan choices, L.A. blows NYC away,” he argues. “NYC has some great spots, but they tend to be pricier, less accessible, and they have substantially less variety. Veganism is on an upward trend in Canada’s largest city, with a marked increase in plant-based eateries and shops popping up around town. Toronto’s creative options for cruelty-free eating include vegan gastropub Porter House and YamChops, which is — wait for it — a meatless butchery, featuring Beet Burgers, and No-Crab Crab Cakes. “One restaurant that needs to be on your radar is Tori’s Bakeshop,” states Lauren Yakiwchuk, a local and vegan travel blogger of JustinPlusLauren, referring to the bakery and cafe which is, during its evening hours, Canada’s first vegan wine bar. Toronto also hosts a bevy of vegetarian/vegan festivals and major events, including the two-week Veggielicious celebration and Veg Food Fest one of North America’s largest vegan festivals. In a country where roughly half its citizens have meat-free diets, finding vegan options is certainly no difficult task. The four-million-strong city of Chennai is India’s leader of the veggie-friendly pack, due in part to its location in South India, a region known for using less dairy products and meats in everyday cuisine. In Chennai, even vegan eaters can thoroughly enjoy one of India’s best-rated restaurants, including The Royal Vega, one of the country’s first fine-dining vegetarian/vegan-friendly restaurants based in the five-star ITC Grand Chola Hotel. •An earlier version of this article erroneously identified Toronto’s Raw/Vegan Festival as North America’s largest rather than Vegan Food Fest. Travis Levius is a globetrotting writer, editor and photographer based in both London and Atlanta. His writing has appeared on BBC Travel, Business Insider, Yahoo!, and MSN.